DUP deputy leader Nigel Dodds has called on the Government to “listen to MPs” over the dangers the Brexit backstop plan poses to the UK. 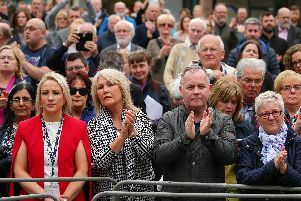 The North Belfast MP was speaking as Cabinet minister David Lidington visited the Province today, as the Prime Minister continued to try and sell her much-maligned withdrawal deal ahead of the crucial vote on Tuesday. And while he welcomed the Tory MP to the region, Mr Dodds said the visit “seems to be more about telling us what we should do rather than listening”. The DUP Westminster leader added: “Rather than a roadshow selling the fundamentally flawed withdrawal agreement, I would prefer the Government would listen to MPs on all sides of the House Commons and finally acknowledge the backstop is dangerous for Northern Ireland and the entire UK. “The agreement is an international, legally-binding treaty which would place a customs and regulatory border between Northern Ireland and Great Britain contrary to the direct pledges of the Prime Minister.